Every once in awhile, we will get a Christmas film that becomes synonymous with the holiday for us. Each person has their own. My two are The Santa Clause and Home Alone. 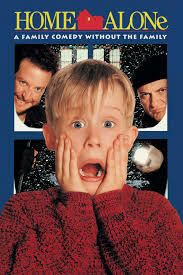 Most everyone I know loves the former, however Home Alone might not be for everybody. Some say it’s corny, silly, and ridiculous. Honestly, I think it holds up pretty well for a film that’s 25 years old. We were more tolerable of idiotic characters back then, and somehow when we watch a film from those years we become more tolerable again. Home Alone may walk a fine line between family entertainment and crudeness, but that’s what makes it unique. Growing up in the ’90s, this film wasn’t bad enough to have my parents restrict me from watching it like they did with The Simpsons, but it wasn’t The Brady Bunch either. Although it involves a family that shows complete disrespect towards each other, it does provide reverent family lessons that can be taken with us. It teaches us how to forgive–albeit too easily in Kevin McCallister’s case–and it teaches us that facing our fears helps us to grow. If I were Kevin, I wouldn’t have really missed my family at all. I feel like the first 20 minutes that we see his family interact with him are a pretty good indication of how they treat him all the time. The amount of terrible parenting decisions and enabling that occurrs is enough to make the audience hate his family and NOT want them to come back. In fact, the only reason why he misses his family is because his life is on the line and he just wants some familiar faces. We forget that they are terrible and he has no business missing them. He would have done just fine with Old Man Marley keeping an eye out for him. The movie is full of plot holes and laughable head-scratchers, and the adult characters all use the same word bank. The events in this film are all pretty ridiculous, but hey! It’s 1990! I have a blast watching this movie and never stop smiling when it’s on. It’s a really fun film, and the music is perfection! Love it or hate it, you always wished you had the chance to rig your house like that.